I once promised more content featuring flats, for those who are less ridiculous than me and don’t place their feet into an ergonomic nightmare every day. When I was thinking about what that content might be, the immediate answer was: how do I wear sneakers without wearing jeans/some other denim compromise? Because my wardrobe is full of many options and it feels ridiculous to get to the weekend, the two days a week where I have true wardrobe autonomy, and throw on a pair of Adidas Campus with a pair of Levis. What a waste of 55 million dresses and 23 million skirts and 4 pairs of shorts. In winter I found it close to impossible (I mean, winter is a boring time to get dressed in Wellington because it’s inclement and cold and I truly, truly understand why animals just hibernate). I’ve tried wearing sneakers with skirts before, and results were mixed; however, the beauty/terror of a blog is that you can look back through years of blog content and really analyse your own looks to figure out where you went wrong. It’s very healthy and not at all a deep dive into self-obsession. Having stared at these photos for a bit, I decided that my mistakes could be boiled down to: wearing an insipidly pink skirt on legs that were frankly paler than they had any right to be; and, in conjunction with that unflattering colour, a skirt that was an awkward length in flats. The key was to avoid a skirt that would cut right across my least favourite bit of my leg, which I shall call the “above knee pudgy region”. I’ve always had this wee bit of, shall we say, “stodgy” leg, even when I was at my fittest during my teen years. The rise of the midi-skirt has been a powerful and excellent situation for my upper knee confidence. I watched my fair share of the Trinny and Susannah behemoth in the early 2000s, so I know that you’re not supposed to like how you look in midi-skirts because they don’t cut at the narrowest part of your leg and therefore make you look like your legs aren’t “shapely”. First of all, times have moved on and I like to think fashion is no longer obsessed with making perfectly content women ponder whether or not their legs look sufficiently shapely (AHAHAHAHA gosh I’m hilarious), but also, fashion is a trendy beast and so now midi-skirts look normal to us all. And thankfully, many of the monstrosities visited upon the women in that show have now slid into (admittedly, temporary) fashion oblivion. Great idea for a post though – watch some Trinny and Susannah and see if I can come up with updated versions of their looks. Can I do it without punching the screen, stay tuned. Speaking of the temporary nature of trends, a slinky/swishy skirt and a pair of “trainers” is a nod to the 90s that I can get behind, unlike various other trends from that era that are experiencing a redux (it’s just a hard no for me on sunflower print, if you see me wearing it please give me a kick). There’s something weird about experiencing the revival of trends you remember on the first go around, and I think it makes you more sensitive to looking like a frigging idiot on the second go. Probably because you realise you’re getting old *cries at the realisation that the 90s were 20 years ago*. 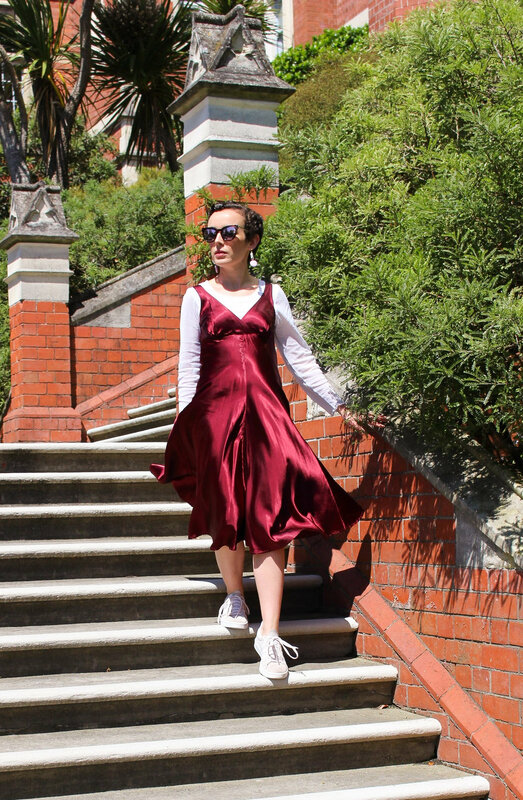 This Carly Harris slip dress gives the 90s flavour of layers and that girly vs athletic blend that we all favoured, but the fuller skirt (instead of full slink) is a more flattering twist, and the berry tones steer away from anything too girly. Plus, it’s silk (but at the low, low price of second hand clothes) so a total delight to wear. It was immensely sunny this day so it’s close to impossible to tell, but these sneakers are a very pale mauve which look parfait deluxe with the berry colour of the dress. These are the Adidas Campus, which I consider to be the best of all their suede styles, because they don’t have any design elements across the toe box at the front. There’s absolutely no way in heck that I can keep pale coloured suede sneakers clean – I tried for about a week after I bought these, then accepted reality and promptly gave up. I have things to do, I can’t be worrying about dirty sneakers, and anyway, a slightly grubby sneaker with a silk dress is just example no. 279 of “juxtaposition as an outfit device”. Having cracked the code of sneakers with dresses (which, to recap, was: a flattering colour, and a cut that I liked my God, she’s a genius), I can see a fully enriched existence stretching out in front of me. Full of scenes of me twirling about in pretty dresses, my feet floating on two small clouds… And the great news is, there’s no risk of me becoming what the kids call a “sneaker head” and buying 100 pairs of immaculate kicks, because I absolutely accept I will ruin them all within a week. Considering I’m still wearing the same pair of disgusting Converse I bought three years ago which have actual holes in them, sneakers are very much a sometimes food, as the Cookie Monster would say.